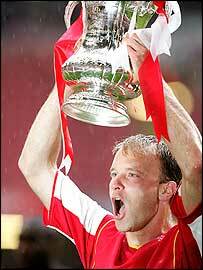 Arsenal striker Dennis Bergkamp will stay at Highbury for another season. The 36-year-old former Dutch international hoped to persuade Gunners boss Arsene Wenger to extend his 10-year career at the club. Wenger admitted after victory over Manchester United: "Dennis probably should stay on for one more year." Wenger has stressed Bergkamp cannot expect a starting role but the striker believes he can last another campaign. Bergkamp joined Arsenal from Inter Milan in 1995 for £7.5m. And Bergkamp has repeatedly made it clear he wants to end his career at the club before retiring from the sport.